If you like the bright colors of fruit machines and if your mouth waters over the delicious looking fruit symbols, then the Froot Loot slots will see you wearing sunglasses and a napkin at your desk. Click here to play! 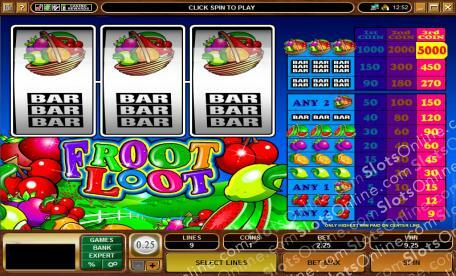 With 5 different fruits, a fruit basket, and BAR symbols, the Froot Loot slots are the ultimate in online fruit machines. As 3-reel classic fruit machine slots, playing the game is very simple. You just choose the coin value to play and the number of coins to play, and then spin the reels. With a single payline, you will never be confused as to which combinations have won you a big prize, and you can easily make the maximum bet to take advantage of the major jackpot of 5000 coins. If just the thought of red cherries, tart limes, juicy oranges, delicious apples, and refreshing watermelons makes you hungry for slots, then be sure to tuck in to the Froot Loot slots.